Some of our volunteers have a very long pedigree. 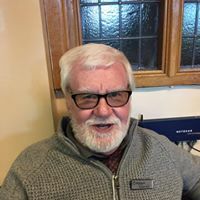 Parishioner Frank McDonald first came to Minsteracres as an apprentice joiner when he was 15 to help on the conversion of the old stables block into the new retreat house. A local boy and member of the choir at St Patrick’s in Consett, Frank was not the only youngster to be drawn into the restoration project back in the ‘60s. “Funnily enough, lots of others of my generation on the project went on to become joiners, builders and tradesmen and I think the inspiration came from what we learned at Minsteracres at that time,” he says. It was a great experience. “We had a whale of a time. Often we didn’t go home for the whole weekend. We’d work until dusk and stay in what is now the youth centre, or in the flats overlooking the cobbled yard,” he says. 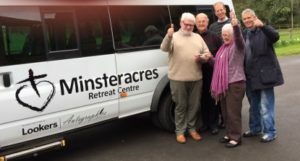 The memory of that time never left him and 40 odd years later he returned as a parishioner at St Elizabeth’s and a volunteer at the retreat centre, most recently collecting visitors in our new minibus or taking them on trips during their stay. When Frank heard we were planning a celebration of the retreat house’s 50 years, he set about trying to find people connected with the original conversion and their families to invite them to the anniversary on Sunday 17th September where the chief celebrant will be Bishop Seamus Cunningham. Of course many of the original team have died, but some survive and have received their invitation, as have the families of others he has tracked down.